Unplug the microscope. Open the bottom of the microscope to reach the lamp. Pull the lamp out and replace it with a new one. Never touch a new lamp with your fingers. Careful, the lamp may be hot! 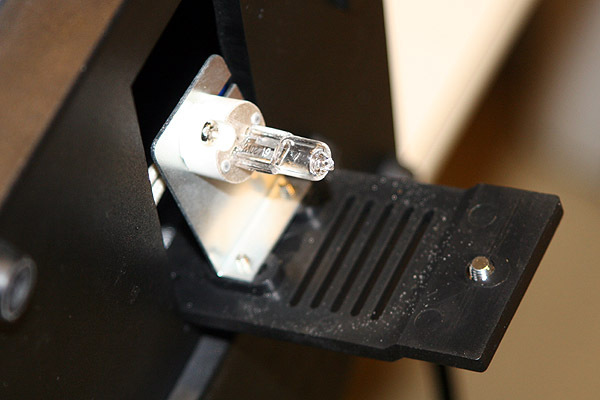 A microscope lamp will last for many years. Tungsten lamps have the disadvantage that the color of the light will shift towards the red end of the spectrum and it may be necessary to exchange the lamp even before it burns out. Digital cameras are sensitive to the red end of the spectrum. This shift in color can easily be compensated by using a blue filter (“daylight filter”), but I have also seen older lamps which have a very pronounced red component. When replacing a lamp, follow the instructions of the manufacturer. The following instructions are for microscopes that have a lamp compartment accessible from the bottom. Turn the microscope to its side, taking care that the eyepieces do not fall out. Open the lamp compartment on the bottom of the microscope. Flip out the lamp. Remove the lamp and replace it with a new one. Do not touch the new lamp with your fingers, wear gloves or use a piece of cloth. Fat deposits will burn into the lamp and result in a darker image. Follow the instructions of the manufacturer when changing lamps. The presented method may not apply for all microscope types.